There’s a sense of zenness we experience from being by the water. The mind feels rejuvenated, the body feels relaxed, and the soul feels cleansed. If you aren’t close to an ocean or lake, or have a backyard swimming pool, there are other ways to incorporate water elements into your very own backyard. Let the following unique water feature ideas inspire you to create your own water feature to bring a sense of tranquillity, peace and beauty to your home. 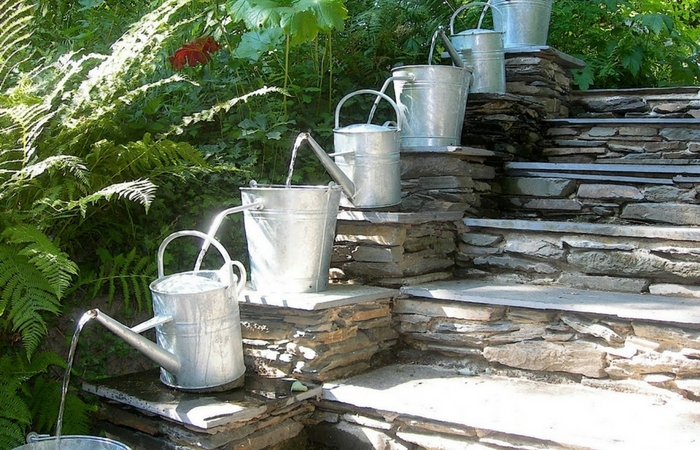 Upcycle and repurpose flower pots into an interesting and striking outdoor water feature. Simple in design, with a myriad of aesthetic choices; terracotta creates a rustic, homey feel, whilst glazed pots offer a sleeker look. Consider adding some pebbles or flowers to create some extra interest, and brighten the overall effect. Detailed instructions for construction can be attained from The Happy Homebodies. 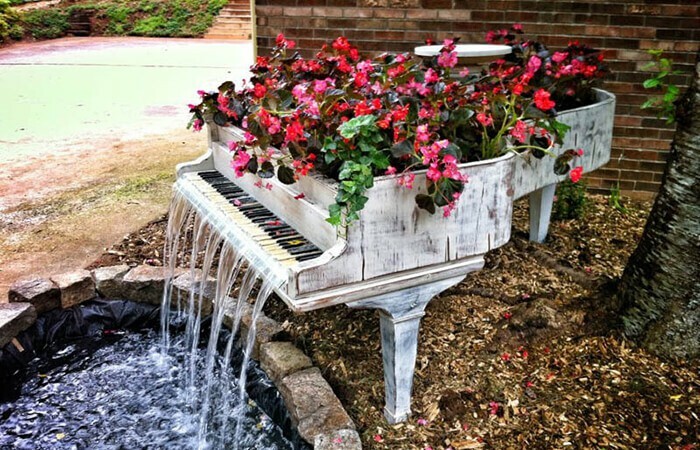 Bill Metzgar, a beautifully creative soul, turned an 1885 Steinway piano into a magnificent fountain. To complete his work of art, Bill added gorgeous red and pink flowers sprouting out of the piano’s soundboard as some final touches. You can read more about Bill’s creative piece here. This idea is an incredibly unique way to upcycle a piano that is beyond repair. If you’re not bothered by some wear and tear from the natural elements, and have a sizeable space to fill, consider repurposing an old structure — like a chest of drawers — or a musical instrument — like a trumpet or tuba — into a magnificent fountain feature. Have an old boat that just isn’t sea worthy anymore? 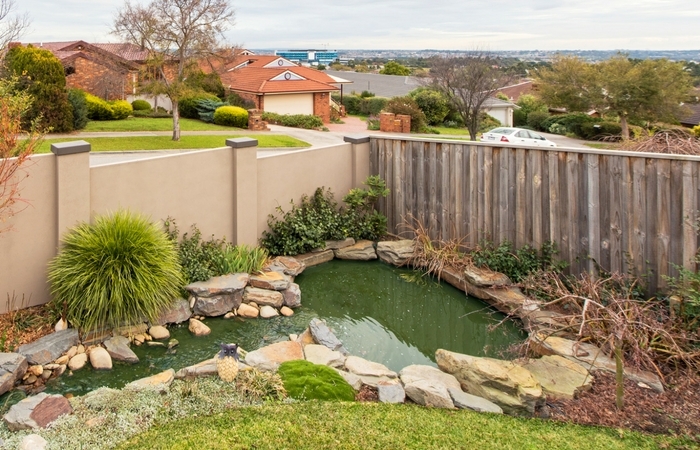 Create a gentle pond with fertile plants to add a touch of playfulness and flair to your outdoor space. A boat, kayak or canoe pond is self-contained within its own structure, and will therefore be of minimal disruption to nearby plants. Enjoy the pleasant chirping of feathered bird visitors drawn to your watering hole, and use aquatic plants such as lily pads, Chinese evergreens, arrowheads or English ivies to support a beautiful natural ecosystem. For the nature lovers, the bush trekkers, the campers and the wild folk; embrace the power of the pond! This landscaping idea will completely transform your outdoor into a private pocket of tranquillity. Made deep enough, it could even double as a plunge pool for those who don’t have the space for a full sized swimming pool! Add an oriental touch to your backyard with this delicate bamboo bowl. The gentle spilling of water into the natural wood bucket will create a calming focal point for onlookers. The feature is also fairly straightforward to construct, and perfect for gardens that are small in size and unable to accommodate a larger fountain or pond feature. The bamboo bowl can be placed on any backyard table, bench, or nestled within a garden bed. Keep calm and have a fountain of tea. Bring the kitchen into the garden by transforming old iron teapots, watering cans, barrels, buckets and urns into a unique water feature. Find a full list of instructions on how to create the tea pot fountain here. Spruce up the surroundings with classic garden flowers like delicate pansies, marigolds, or carnations for a truly quaint aesthetic. Transform an ordinary garden into an extraordinary one by designing and constructing your own rain chain. Hung from a gutter, this water feature allows raindrops to drizzle down its chains into the ground below. What was once a downpour of runoff from the gutter is now transformed into the pleasant sound of trickling water. Consider copper rings, a combination of bent forks and spoons, or small pots for creating your rain chain. 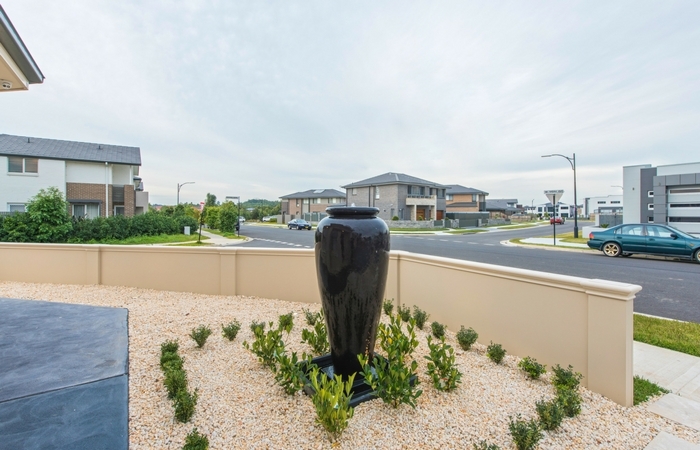 Small in size but bold in appearance, the urn fountain is a stunning addition to any outdoor setting. Play with textures and colours to best match your garden’s theme — select blue, brown, green or grey blend in with almost any scheme, or choose to feature it with mosaic tiling, texture paints or with a bright feature colour. Want to hit the ‘MUTE’ button on noisy neighbours, overexcited dogs and loud traffic? Invest in your home’s peace and quiet with a premium acoustic wall or fence. Call 1300 556 957, or simply enquire below.